The main reason why patients choose a mini dental implant over traditional ones is that they do not have sufficient density in the jaw bone to support the length of the traditional implant. A mini implant is shorter and wider requiring less density to remain secure. The different shape makes it possible for more people to replace their teeth using this incredible solution. Otherwise, people who want implants will need a bone grafting procedure in order to do so. 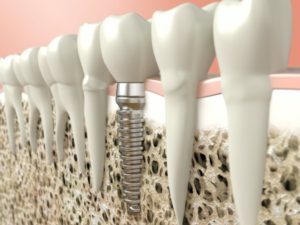 This additional step adds time to the overall treatment process and expense – two things that placing the mini implant can eliminate instead of a traditional one. The success rate in placing implants of any kind is extraordinarily high. Most people are able to have this procedure, receive a new tooth or new set of teeth and enjoy the benefits of them without any issues. They should remain securely in place, look fantastic and make it possible for patients to eat their favorite foods and smile without concerns about their teeth. If you are resolving to replace missing teeth in 2018, we recommend calling our office and scheduling an appointment to find out if mini dental implants are the right solution for you. After conducting an exam, we can make a recommendation and then discuss the process in greater detail. Ultimately, we are here to provide the best possible way for you to replace your missing teeth. We are confident in our ability to do so and encourage you to call today. Request a mini dental implant consultation here: https://dentistlindennj.com or call AC Dental of Linden at (908) 905-0747 for an appointment in our Linden dental office.